Each of us sees more than 5,000 marketing messages every single day. In such a crowded marketplace, brands are scrambling to find new ways to cut through the clutter to reach consumers. With such intense competition, it’s critical to stand apart beyond service and price. How to earn your audience’s attention and provide value at every touch point. How to tell a meaningful story. How to give your customers agency in the conversation and accept that they’re in charge. How to listen, not sell. Change your strategy and your tone and you can change your results. Applying the rules from Conversation Marketing will help brands become publishers, increase sales, and establish a lifelong connection with their customers. 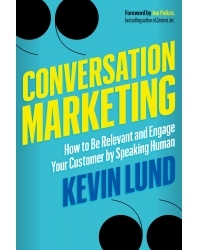 Kevin Lund is an award-winning content-marketing pioneer and internationally lauded lecturer. As the founder of T3 Custom, he has deep expertise building out digital marketing strategies and print content across various platforms, such as web/mobile/tablet sites, social media campaigns, magazines, newsletters, and live events. For nearly 18 years, category leaders like TD Ameritrade, HSBC, Forbes, Charles Schwab, and Gain Capital have relied on Kevin to develop content-marketing solutions that bridge marketing needs with today’s rich information needs. Delivering B2B, B2C, B2B2C, and institutional strategies, he is passionate about helping firms use branded conversation to tell their stories and drive behavior differently. Based in Seattle, Washington, Kevin consults with and has written for the Content Marketing Institute.